In Lubbock, we don’t have them, but they are as beloved as Whataburger around Texas. 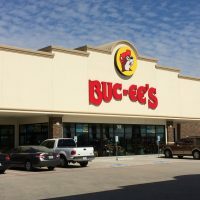 Buc-ee’s seem to have everything. I went to one before a float down the Comal and found little floating thingys to keep my sunglasses from sinking. They also have, or at least had for a little while, a monkey. A monkey that bites. And police want to find it. Terrell police are asking for the public’s help finding a man and his monkey. 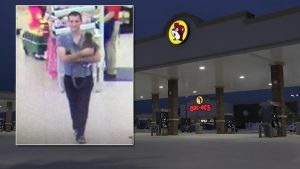 Police say the man was inside the Buc-ee’s off Interstate 20 near Farm-to-Market Road 148 last Friday at about 3:45 p.m. with the monkey on his shoulder. Police say the monkey bit a girl, and police want to be sure the monkey’s shots are up to date. If you recognize the man from a surveillance image provided by police, contact the police department at 469-474-2700.